Top: Caroline Rosen and Club Officers. Bottom: Madison Gutekunst and Club Officers. During the Spring 2015 semester, the Econ Club and the Delaware Environmental Institute co-hosted the first annual Environmental Economics Case Competition in celebration of Earth Month. Students were invited to research and present an environmentally-themed case study focused on reducing or eliminating a source of waste on campus. On May 19th, four student groups presented their ideas at a mini symposium for a panel of three judges. 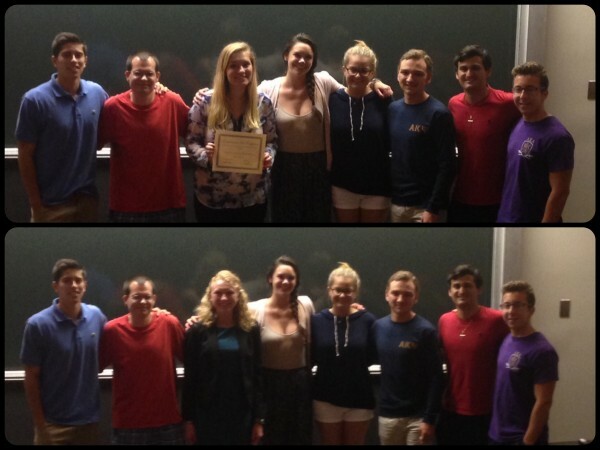 The first place group was awarded a $150 gift card and the second place group was awarded a $100 gift card.